Adopted following independence from the United Kingdom on August 31st, 1962, this striking flag is known as The Sun-Sea-Sand Banner (which seems appropriate, as I'm thinking that a Caribbean nation probably has a surplus of all three of those things.) Red represents fire and the sun (also courage), black is for earth (also dedication) and white is for water (also purity and equality). 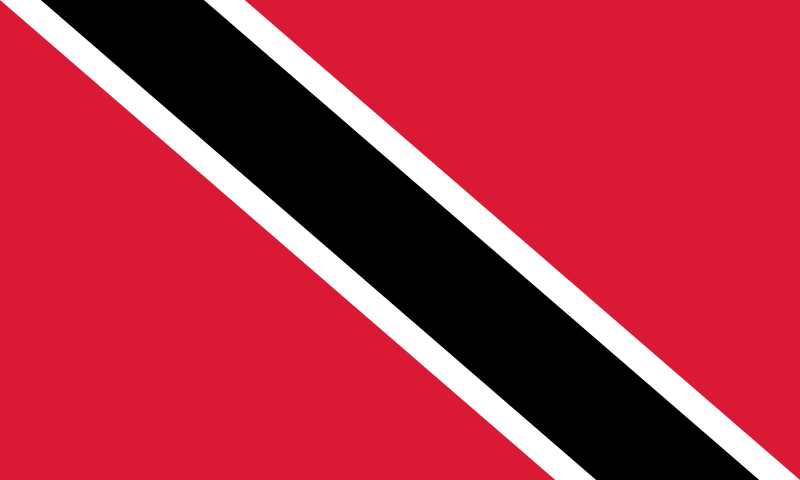 Just a casual glance through Trinidad and Tobago's WikiPage makes for fascinating reading. Settled originally by indigenous tribes in the area, Spain soon moved in and ran the joint for three centuries or so- which would have been fine and dandy and probably lead to an inevitable changing of hands at some point, but it looks like they landed a governor, Don Jose Maria Chacon in 1783 that took a rather loose interpretation of a declaration from King Charles III and ran with it. The promise of free lands for Catholic families will to swear allegiance to the kind of Spain lead to wave of immigration from Scots, Irish, German and English families. During the French revolution, they saw an influx of people from nearby French colonies and finally, the colony shifted over to the British in 1797, which saw an influx from nearby British colonies in the Caribbean. But it doesn't stop there! Chinese, Portuguese and a significant amount of Indians were shipped in as indentured labor in the 1800s. Tobago has a similar history, with Dutch and Courlanders (from a small duchy in modern day Latvia moving during the 16th and 18th centuries. Granted- this fascinating blend of cultures was brought about with a hefty amount of help from things like the slave trade and indentured servitude, but what a blend! Must be a fascinating place to live- not to mention visit. So that's Trinidad and Tobago! Remember, until next time, keep your flags flying- FREAK or otherwise!